Solar is happening right now, but maybe you didn’t hear? Somehow, in all the hubbub of the GOP (good ol’ petroleum) government takedown, (and for those of us who follow climate news, the noise of our internal skirmishes over how much Keystone focus is too much Keystone focus), news about new solar power infrastructure hasn’t reached everyone’s front page. But here’s a cheerful update from the American southwest: two enormous solar thermal power plants are of coming on line, step-by-step, right now. In California, BrightSource Energy’s Ivanpah Solar Electric Generating System is slated to be the largest solar power plant in the world. At a cost of $2.2 billion (its investors include NRG and Google, who are backed by a federal loan guarantee), Ivanpah took four years to develop and uses concentrated solar power, or CSP, to generate up to 377 Megawatts an hour for the state grid. The plant will be at full operating capacity by January. Located on 4,000 acres of now-enclosed public land near the Mojave Desert, the facility features three central towers surrounded by enormous rings of heliostat (sun-tracking) mirrors that direct beams of sunlight onto the towers’ receivers. The receivers generate steam to power turbines whence energy is generated. Visit here to take a slightly nausea-inducing virtual tour of the facility. In Gila Bend, Arizona, the Spanish corporation Abengoa Solar has completed the Solana plant, a $2 billion, 280 Megawatt project. Solana is also a thermal solar project, but it uses mirrored parabolic troughs to heat tubes of fluid, which powers a turbine. The plant also stores heat in molten salt batteries that then release power well into the night, offering a major counter-example to the common critique of solar as intermittent, therefore unreliable. These projects will serve as a proof of concept for the viability of investment in large scale thermal solar, which had lately been second banana to the no-fuss, cheaper photovoltaic solar panels. Thermal solar technology requires a large, flat geographic footprint to generate power on a utility scale, and there has been a lot of opposition to the disruption of desert habitat from these and other large scale solar projects. And while it’s true that photovoltaic (PV) technology is more modular (panels can be installed individually, more or less wherever there’s sun), PV power plants would be equally disruptive when scaled up, and are less efficient at generating electricity. Thermal solar is also less susceptible to the interruptions of passing clouds, and can store and release power for hours after the sun is gone. So if PV is less efficient and less consistent, why is thermal solar losing ground to it? But here we get into the foggy area where environmental concerns meet the global market. A PV power plant is just a lot of PV panels in one place. The technology is known, the outcome predictable, so PV makes a reliable investment. In the warm glow of investor funds, Chinese manufacturers rapidly slashed the cost of production and flooded the international market with PV panels. The flood was so huge and quick that US and EU imposed tariffs on Chinese renewables this summer, in support of their own renewable sectors, or in deference to the fossil fuel lobby, — or perhaps both. Now, it won’t do to insinuate that photovoltaic is bad and thermal is the better choice. Both are crucial pieces to our climate puzzle, serving distinct functions. But what particularly troubles me about PV is its reliance on rare earth metals and the toxic environmental and political processes that extract them. Typically, corporations operating mines do not embrace human rights alongside the rare commodities they seek. And humans still have no good ideas about where to warehouse hazardous materials after we’ve spent their utility. So in anticipation of a future shortage of the necessary materials to produce PV panels, wouldn’t it be wise to cultivate the technology that isn’t restricted by materials availability? A kilowatt is a thousand watts, and a Megawatt (MW) is a million watts. When a power plant is rated in Megawatts, it is the unit of power that refers to its maximum possible output in one hour. A typical American household in 2008 used energy at an average rate of 2 kilowatts per hour. Arizona (pop. 6.6 million) is 26th in US energy consumption, and 23rd in CO2 emissions. It generates its electricity from a mix of sources, led by natural gas, then nuclear, coal, hydroelectric, and mixed renewables in a negligible 5th place. ‘Solana will serve the needs of 70,000 Arizona households!’ we proclaim. Hold up: 70,000 homes is significant, but the tide isn’t turning just yet. If a household is approximately 4 people, 1,580,000 households remain fueled by fossils. And a notable fact about Arizona: 25% of all energy consumed there is in the form of air conditioning (the national average is 6%). California, meanwhile, is a bigger, more complicated beast. While its per capita energy consumption is 47th in the nation, it is the second largest CO2 emitter, behind big, bad Texas. And though it has nearly weaned itself off coal entirely, it is burning a stunning amount of natural gas, and does major business producing and refining crude oil. The state came up 2 percentage points short of its goal in 2010 to meet 20% of its energy needs with renewables. 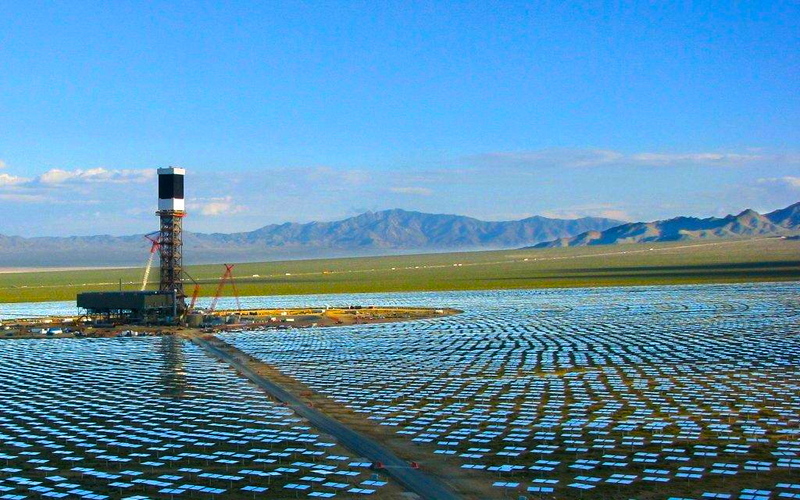 With Ivanpah, California’s total solar generation capacity is raised to approximately 3,300 MW. By comparison, the Moss Landing Power Plant, a Monterey Bay plant that burns natural gas, has a 2,560 MW capacity. Unless renewable initiatives like Ivanpah are met with the decommissioning of fossil fuel plants and further emissions cuts, we’ll just end up turning the indoor temperature of Arizona down three degrees, and allowing California’s Teslas and Leafs to idle on the expressway for more fossil-fuel lite hours.